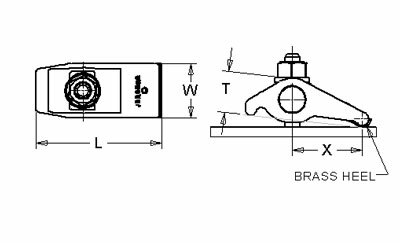 Forged Adjustable Clamps automatically compensate for clamping height changes within their clamping ranges (see chart for ranges). The swivel bushing is permanently mounted in the clamp which alleviates lost or missing parts. The standard brass heel plate protects the machine table. * Holding forces are based upon using Jergens heat treated alloy steel T-slot bolts, studs, T-nuts and Flange nuts in order at the recommended torque.